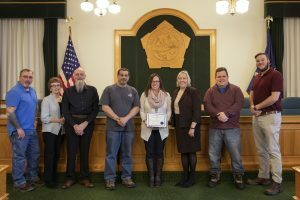 OSWEGO – The Oswego County Legislature’s Finance and Personnel Committee recently presented Julie Bell a certificate of appreciation for 10 years of service to county government. Bell is a human resources administrator with the Human Resources Department. Pictured from left are Committee Vice Chairman Stephen Walpole, District 14; Linda Lockwood, District 11; David Holst, District 4; Committee Chairman John Martino, District 6; Bell; Human Resources Director Carol Alnutt; Daniel Farfaglia, District 24; and Patrick Twiss, District 13.